 Public Lab: Passing Light Through an Object. Passing Light Through an Object. I was trying to work out how to keep the brightness of the image produced. Due to the laws of physics (I know! Those again...) each time the beam of light was bouncing/passing through an object, it was losing energy & thus losing its overall brightness/strength. So, what I did was get three different shaped glasses & fill them with water, so as to record the effects of light passing through them. 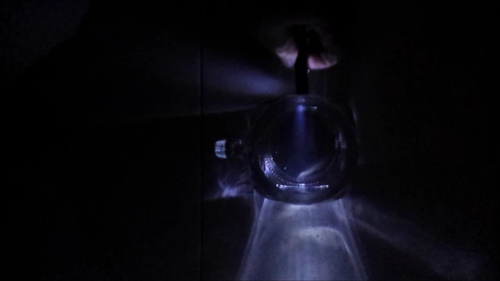 The result was some interesting revelations about how passing light through different shaped containers could potentially affect resolution. In the image above, you can see what I am calling my circular glass, my square glass and my prism glass (which has an octagon base for those wondering). 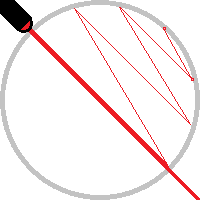 The .gif above is of me passing a red laser pointer through the circular glass. The point of origin for the laser beam is at the bottom of the image - where I am holding it against the glass. You can see as part of the light beam reflects back off of the other side of the glass, the beam splits, continuing to bounce until the photons escape to the right of the image. So, every time the light beam bounces, it loses intensity, as photons are split between reflecting, refracting and being absorbed by the glass. To see how light is divided, I then passed a light back and forth along an x, y and z axis through the prism glass, to help measure how the light bounces. Things that I asserted from what you can see in the .gif's above. X-Axis: The light source needs to be as close to the edge of the sample for the beam to be visible. Y-Axis: It is best that the light source is perpendicular to the surface that it is shining through. Z-Axis: It is best that, whatever the volume of the sample in the container, to shine the light through the middle of the sample. The light loses intensity each time it interacts with a surface. To keep the intensity of the light, it is best to use a container with as few surfaces as possible to contain the sample. This means, that containers with flat sides work better than those with round ones (so a squared vial is better than a circular one). Even better still, removing a dimension entirely, having the sample contained between 2D slides as opposed to being held in a 3D glass vial works best. Re-designing the inside of the 'lil box for the oil testing kit - so that the light is shining directly onto the sample and interacting with as few surfaces as possible.